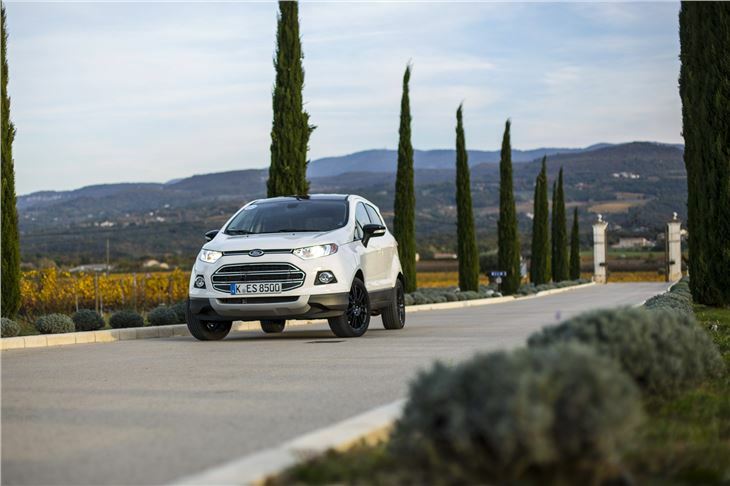 A mid-life refresh usually comes after three or more years – but after a little over 12 months, the Ford Ecosport has already been revised. That's either very rapid progress or an admission from Ford that the car wasn't all that good in the first place. Whatever the case, it's been improved, though Ford still has fairly modest sales aspirations compared to its other models. The most obvious change is the removal of the dumpy-looking externally-mounted spare wheel, which has been swapped for a tyre repair kit, fitted under the boot floor. 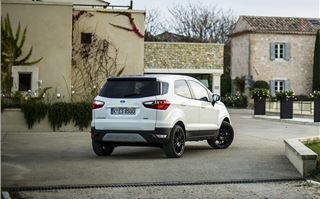 The result is a more conventional-looking crossover which should prove easier to reverse park in tight spots – though the tailgate itself is still side-hinged and consequently very hard to open properly in a small space. Once the tailgate is open there’s a reasonable amount of room, no better nor worse than other small crossovers like the Nissan Juke. 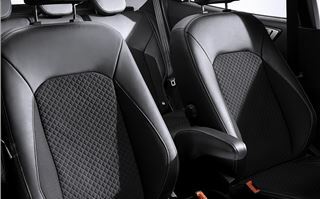 The back row of seats is spacious enough for a pair of adults, at least for shorter trips – and it can be folded down to increase load volume from 310 litres to 1238 litres. Up front the cabin looks just like it used to in the Fiesta, albeit before it was revised. That’s bad news, since the updated Fiesta has a much neater, more user-friendly centre stack that’s missing here. Instead there's a scattered mess of buttons that are fairly difficult to understand, at least at first. On the plus side the fit and finish has been improved over the earlier Ecosport. The material quality still leaves a lot to be desired though, despite the improvements. The soft-touch materials used in the Fiesta are sorely missing from the Ecosport – instead there is a drab, hard plastic covering on the dashboard and door tops. At least it’s hardwearing – and there are plenty of little cubbies for storing odds and ends. 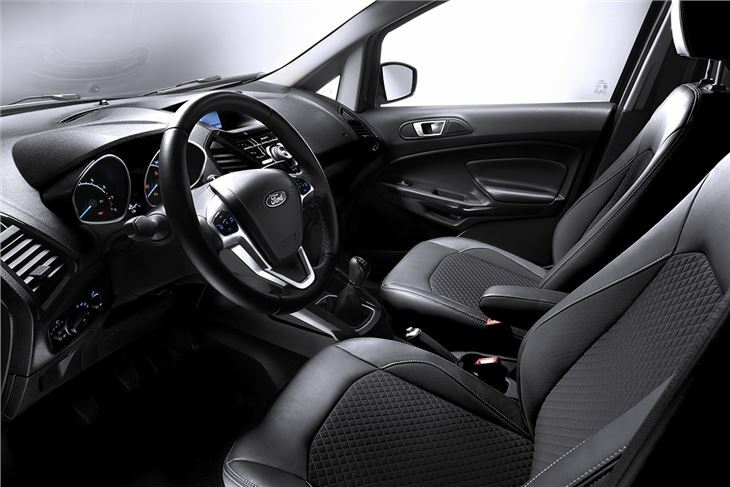 The steering wheel - now the same as used in the Focus - has a leather covering, which is a welcome addition, as is a new optional winter pack. 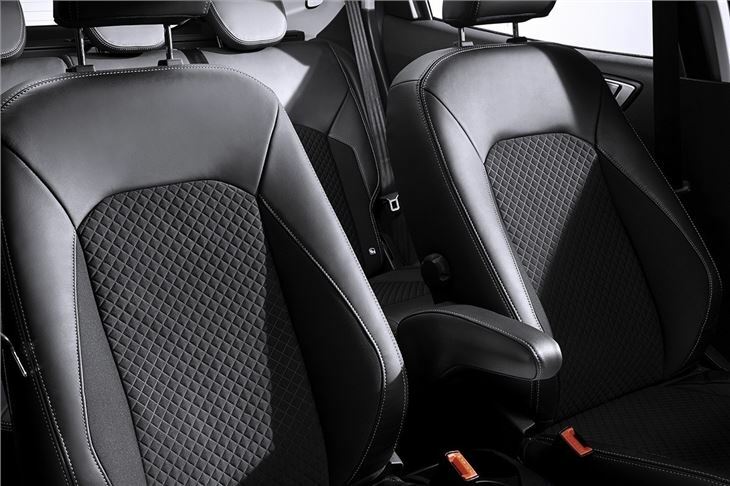 This adds a heated front windscreen, which quickly fixes both frost and condensation, plus it includes heated front seats and low-level ventilation for rear seat passengers, which should help keep cold toes at bay for those in the back. But more important than all of the visual tweaks and improvements are the changes to the drive. Ford has revised the suspension arrangement to make the car less wobbly and more Fiesta-like. So while it is still a far cry from its hatchback relation, it’s a lot better than it used to be, with better body control through corners and more responsive steering. There is more immediacy to direction changes than before, an improvement that more enthusiastic drivers will appreciate. It’s not a radical upgrade by any means, but it’s still welcome. Ride quality over potholes remains acceptable if not remarkable and the gearchange is light, if not quite as slick as in the smaller Fiesta. We drove the new Titanium S model with a 125PS 1.0-litre EcoBoost engine, which is just as impressive in an Ecosport as it is in anything else. It produces plenty of torque for such a small engine and it’s responsive, so whether driving in town, on the motorway or in the countryside it’s easy to get on with, forgiving lazy gear changes. It’s quiet, too, thanks in part to some additional soundproofing materials. 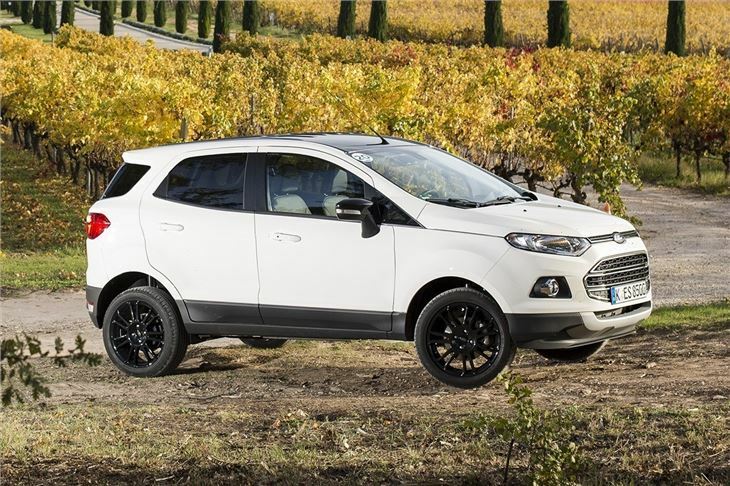 But when sales start in the UK in 2016 the Ecosport Titanium S will actually come with a more potent 140PS version of the engine, which works very well in the Ford Fiesta. 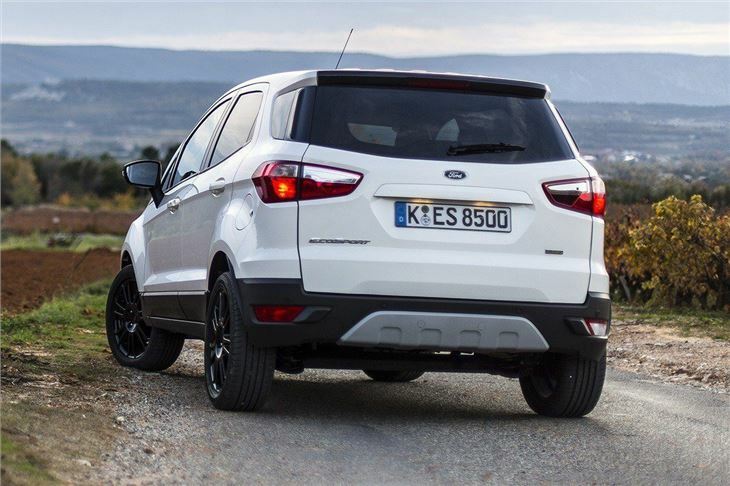 This should add some welcome extra performance, further livening up the Ecosport. Emissions and economy are to be confirmed but should be similar to the 125g/km and 53.3mpg of the 125PS version. The Titanium S trim level is new and sits at the top of the range. 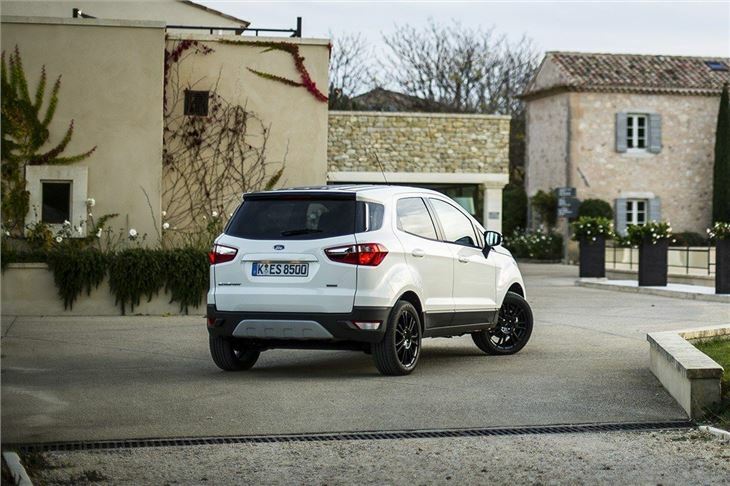 It includes black alloy wheels, a roof spoiler, removed roof rails and tinted glass which, combined with the removed external spare wheel, make the Ecosport look more conventional. The styling changes are in addition to the standard-fit climate control, keyless entry and start, cruise control, half-leather seats and all-around electric windows fitted on Titanium models. 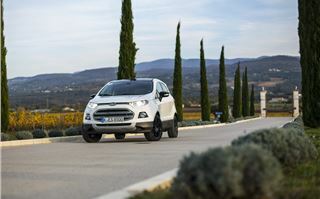 All-in-all, the updated Ecosport is appreciably better than it used to be, yet the changes aren’t quite enough to elevate the car above rivals like the Renault Captur or Nissan Juke. 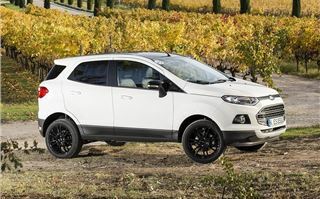 There’s nothing about the Ecosport that stands out as terrible, but nor is it in anyway great or special. Still, if you like the way it looks it’s certainly worth a test drive. 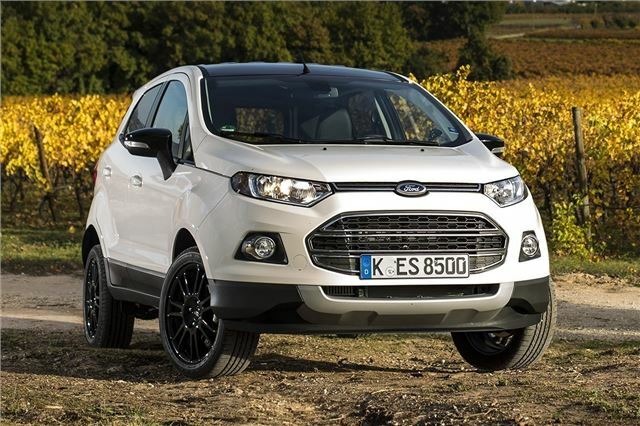 The revised Ford Ecosport is one sale in now.